MC Hammer Gang: Motor Cycle Hammer Gang AKA Martilyo Gang? "Shot this sundown at the Roxas Blvd and Airport Rd intersection and I hope the following speculations are yet to be proven wrong. Crossing fingers. First of all, keep in mind, IF these gentlemen ARE carpenters or workers, then why is the passenger wielding a hammer in such a manner to strike anything as planned which explains not having the handyman's tool in a bag? Are these men up to something which would later explain such? Imagine this, at a stop along the boulevard, you're on your phone while at a stop, and your car window suddenly cracks or even crumbles...whatever happens next clearly would be anything but pleasant. 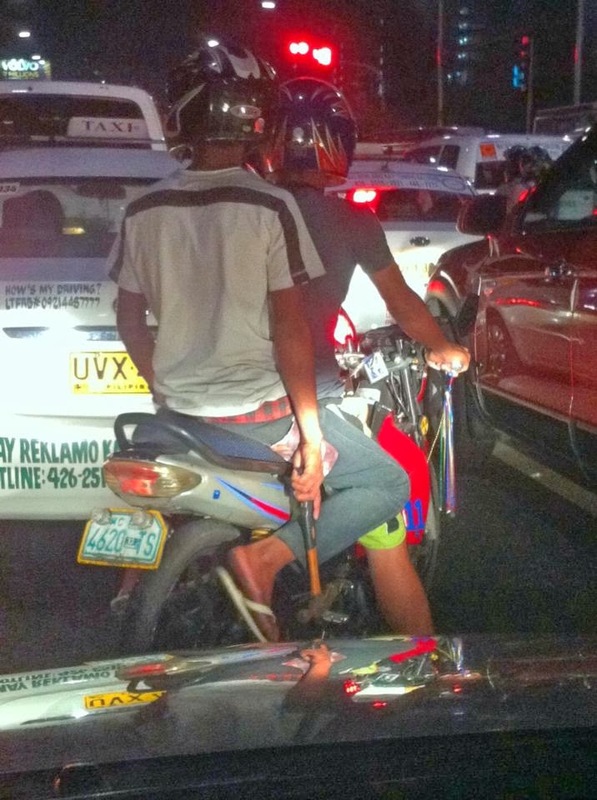 These motorcycle riders look "very suspicious naman kasi lalo na sa pagkakahawak niya ng martliyo. Talagang obvious na may balak eh. Kaya dapat lahat na ng drivers and car owners maging aware na rin. Pero di nga malay ba natin. These people must have found another means of terrorizing us. Specially pag puno ang sasakyan ng tao they could smash your windows and hold you at gunpoint and take your belongings most likely in middle lanes and in really bad traffic jams. The bike has a plate number which can be a lead, but the same goes na baka nakaw din yan. Looks like kelangan na talaga ng preventive measures from our authorities. Kung kelangan ng shoot to kill order specially sa ganitong kitang kita yung martilyo. Sana gawan agad ng paraan. For those who liked this post, I encourage you to share this and make it viral. It wouldn't hurt to do so. I for one wouldn't want to hear any of our relatives and friends post an incident involving themselves and these crooks. Keeping a tear gas can or even two in your car would definitely be a grand idea, too. When walking along sidewalks stay away from the road and within arm's reach of motrocyclists, masakit ang mamartilyo sa ulo and lose your stuff, masama pa kung baunan lang pala laman ng bag niyo. Kidding aside. Repost na. Para mahuli na yung mga yan and stop them before they do anything at all." If the alleged criminal plans of these gentlemen are true, we should be more alert and cautious while walking down the streets since that is where they are most likely to strike. It is sad that poverty and lack of education drives criminals to do despicable deeds just because they are desperate. I hope that the authorities can do something about this issue. Crimes are everywhere. It's up to us to be cautious. However, before we point a finger on those people committing crimes, we must first look at the source of all those things. Why are they committing such human acts?